Bring your favorite peanut butter and jelly flavor combo to breakfast or snack with this easy granola recipe. 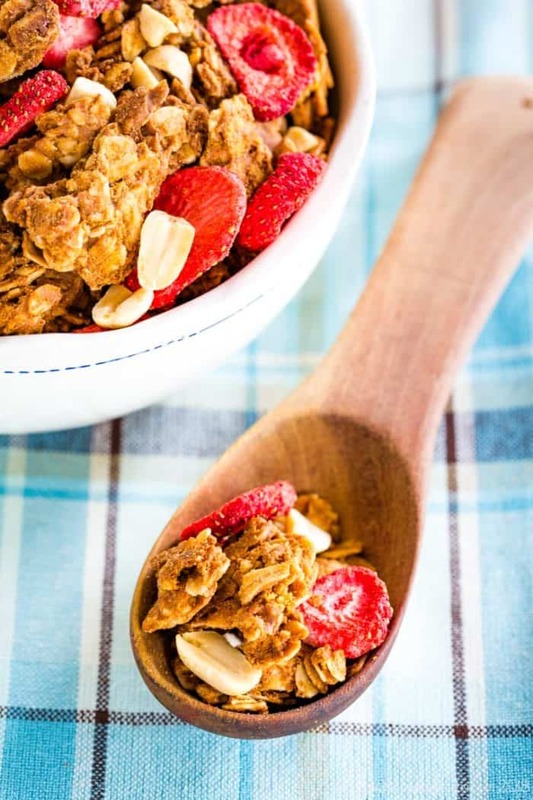 Peanut butter granola with bits of freeze-dried strawberries brings your favorite combination of peanut butter and jelly to breakfast or snacktime. And if you don’t want to put it on top of yogurt, then you can just eat it by the handful for a crunchy afternoon snack. With whole grains, protein, and that perfect sweet-salty pairing, one of your favorite healthy gluten-free granola recipes will definitely be this Peanut Butter and Jelly Granola. Some days this 39-year-old mom of two feels pretty good about herself. Exercise is part of my daily routine. I eat fairly healthy, despite my occasional need (yes, need. I said it.) for a big scoop or three of Caramel Toffee Chip Cheesecake Ice Cream. I’ve even been taking care to buy better products for my hair and skin. And I actually use them versus just letting them sit in their boxes and bottles. Other days, well, on other days not so much. Like when I go to the grocery store and ask the cashier to put the bulk-size packages of Cheerios and pretzels in a separate bag. I tell her I’m sending them into school with my kid for snacks. Then she asks if he is heading back to college. OK, OK, technically I could have a college-age kid. But that would mean I became a mom at a fairly young age and would still actually be quite youthful. Maybe I’m just kidding myself that 39 is actually youthful. Maybe I need to pretend I’m youthful by eating peanut butter and jelly snacks that remind me of when I was an actual youth. I know, I know, your mind is blown with the concept of peanut butter and jelly granola. Big clusters of peanut buttery granola with a hint of honey sweetness. The sweet tart flavor of dried strawberries. And for even more crunch, an extra handful of chopped peanuts. Yes, it all comes together into one amazing and easy granola recipe. It makes these Peanut Butter and Jelly Yogurt Parfaits extra amazing. 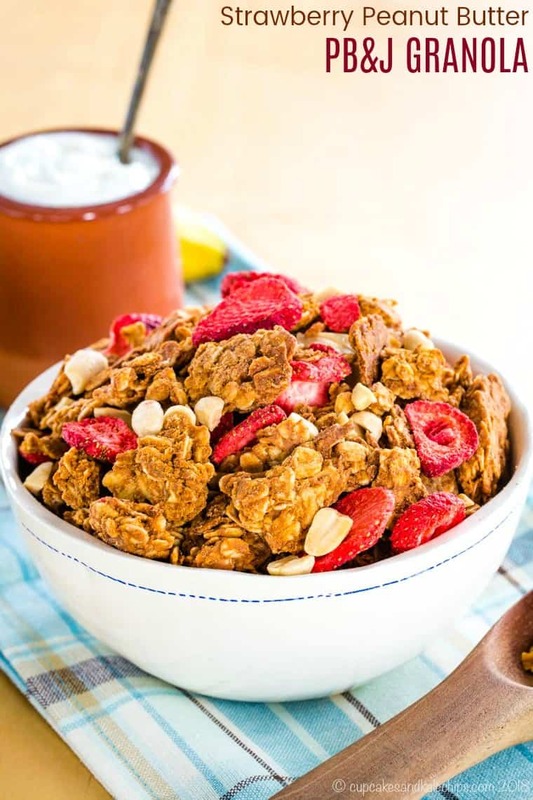 How do you make Strawberry Peanut Butter Granola? First, stir together creamy peanut butter, honey, and salt. Pour the peanut butter mixture over old-fashioned oats in a large bowl and stir to coat completely. Spread the mixture onto a sheet pan lined with parchment paper or a silicone baking sheet and press it down. This helps to form the clusters. Bake in a low oven for about 30 minutes. Then carefully stir without breaking up all of the large pieces and spread it into a single layer. Pop the baking sheet back into the oven for another 20 to 30 minutes, checking every 10 minutes until it is mostly dry and crisp. It’ll get more crunchy as it cools on the sheet. Once it is comepletely cool, toss with chopped peanuts and freeze dries strawberries. It it important to make sure if it at room temperature with no residual warmth or the strawberries will absorb moisture and not stay crisp. Store in an airtight cotainer at room temperature. You can sprinkle it over plain, vanilla, or strawberry yogurt or have it in a bowl with milk. It even adds texture as a topping for smoothie bowls or oatmeal. And for a yummy luchbox treat, spread apple rings with peanut butter and top with some of this Peanut Butter Strawberry Granola. 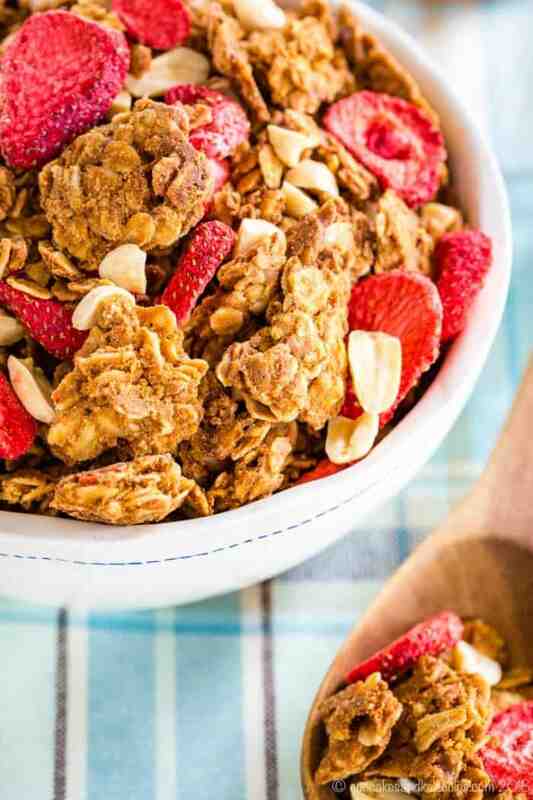 While some prepackaged granola is healthy, others are loaded with sugar, preservatives, and extra fat. 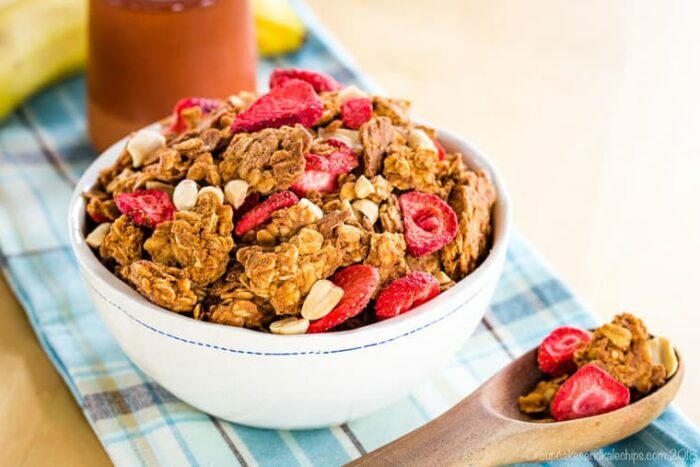 Granola often contains ingredients that provide plenty of fiber, protein, and nutrients, like whole grains, peanut butter, nuts, seeds, and even superfoods like flax seeds and chia seeds. However, watch out for excess amounts of additional like chocolate and dried fruit, plus multiple sources of sugar, like corn syrup, molasses, rice syrup, evaporated cane juice, and more. Homemade granola can be good for you since you control the quantity and quality of your ingredients. You can easily avoid using refined sugars by using raw honey, like in this recipe, pure maple syrup, or even coconut sugar like in Coconut Chia Granola Clusters. And you can even cut down on the oats and dried fruit and increase the nuts and seeds for added nutritional benefits, like this Nutty Maple Granola. That does mean that homemade and storebought granola can both be fairly calorie-dense, so watch your serving size and stick to about a quarter cup. A lot of storebought granola uses wheat fillers and other gluten-containing ingredients. One of those ingredients is oats, which commonly has cross-contamination due to oats being grown in fields that were previously wheat fields, or from processing on shared equipment with wheat. If you make it at home, you can use certified gluten free oats if needed, as well as check the sources of your other ingredients. 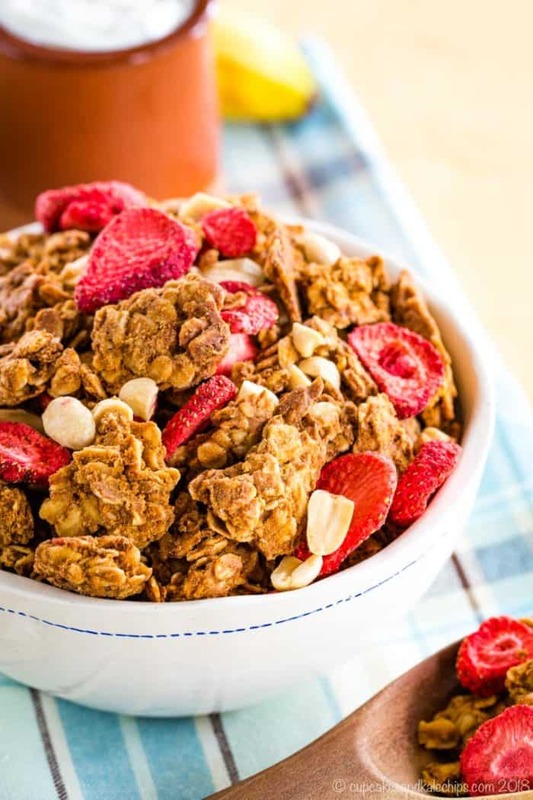 While some people with celiac disease are also sensitive to oats, even those that are certified, many with gluten sensitivity can still enjoy homemade peanut butter granola or other granola recipes like Apple Cinnamon Granola and this recipe. What else can you make with peanut butter and jelly? Kids will love coming home to a platter of Peanut Butter and Jelly Apple Nachos. PB and J Cookie Dough Dip is made with a sneaky healthy ingredient to make it flourless. Peanut Butter and Jelly White Chocolate Bark is a tasty treat that makes a great gift. Pack some Peanut Butter and Jelly Swirl Whole Wheat Crackers in the kids’ lunch boxes. Or upgrade your favorite candy with Peanut Butter and Jelly Peanut Butter Cups from Texanerin Baking. While you can use parchment paper, I have become a big fan of using silicone baking mats for making homemade granola. For recipes like this or Pineapple Coconut Tropical Granola, when you want to form clusters you want to be able to press down the mixture and bake it till crisp. But you don’t want it to stick or burn. Silpat is the original brand of silicone baking mats, and are a very high quality. I’ve used mine over and over. But you can also get AmazonBasics Silicone Baking Mats as a more economical option. The peanut butter and jelly flavors in a crunchy breakfast or snack. 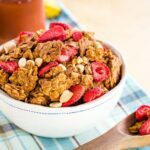 This peanut buttery granola has large clusters plus a sprinkling of roasted peanuts and freeze-dried strawberries. A bit of honey gives it the perfect amount of sweetness. 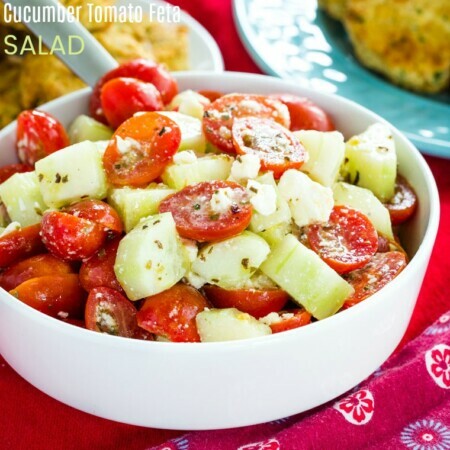 Pour it in a bowl with milk or yogurt or just eat it by the handful. 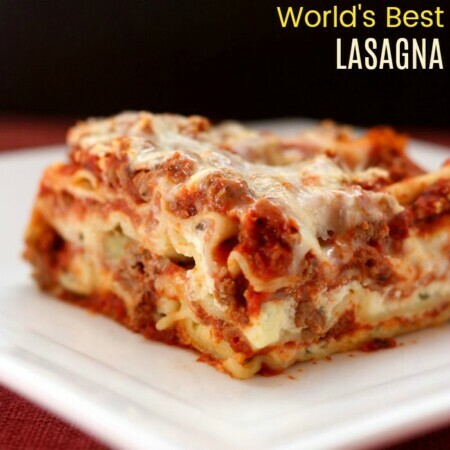 It’s super yummy and totally satisfying. Preheat oven to 275°F. Line a sheet pan with parchment or a silicone baking sheet. In a small, microwave-safe bowl, stir together the peanut butter, honey, and salt. Microwave for about 30 seconds or until you can stir it into a smooth mixture. Place the oats in a large mixing bowl. Pour the peanut butter mixture over the oats and stir until completely coated. 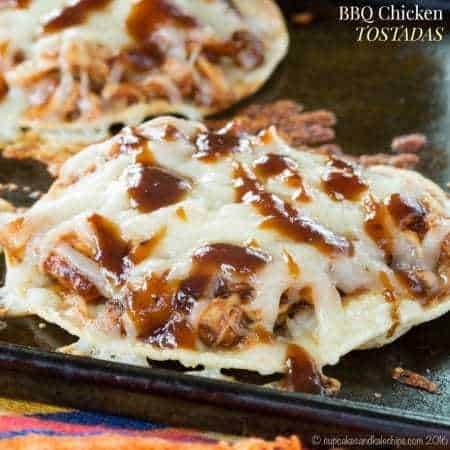 Spread in a single layer on the sheet pan, and press down. 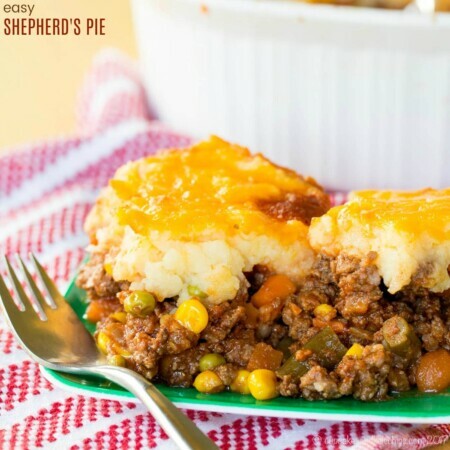 Bake for 30 minutes, then stir gently without breaking up all of the large pieces. Spread into a single layer. Bake for another 20-30 minutes, gently stirring and checking every 10 minutes until dried out and slightly crisp. It will become more crisp and crunchy as it cools. Cool on the pan until it reaches room temperature, then mix in the peanuts and freeze-dried strawberries.